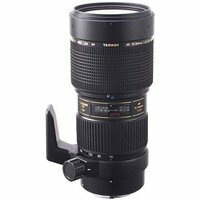 The Tamron SP AF 70-200mm F/2.8 Di LD (IF) MACRO, is a lightweight, high-performance and fast tele-zoom lens designed for DSLR cameras with both 35mm full-size image sensors and APS-C sized sensors. Its fast f2.8 aperture enables photographers to work with the minimum depth of field or at higher shutter speeds to freeze action shots whilst offering a the best-in-class Minimum Focussing Distance of 0.95m over the entire zoom range, giving an impressive macro magnification ratio of 1:3.1 when zoomed to 200mm. The advanced optical construction of the AF 70-200 f2.8 with Tamron's Multi Lens coatings minimise the possibilities of flare, with three LD (low dispersion) elements effectively compensating for lateral and on-axis chromatic aberrations, resulting in edge-to-edge sharpness and high-contrast image quality to challenge far higher priced alternatives from the mainstream camera brands.